Excellon is in full production and has resumed shipping ore to its mill in Miguel Auza. TORONTO, Oct. 24, 2012 /CNW/ - Excellon Resources Inc. (TSX:EXN) ("Excellon" or "the Company"), Mexico's highest grade silver producer, is pleased to report results for diamond drill holes EX12LP1023A, LP1024 and LP1025 drilled in the Rincón del Caído ("Rincón") area, 1 km northwest of the Platosa Mine. All three holes encountered significant sulphide mineralization within "Source"-type geology. The holes are step-outs from drill hole LP1019 (see press release dated July 9, 2012) and six holes have now encountered encouraging results within an irregularly shaped area roughly 60 m from east to west and 35 m north to south that remains largely open. Assay results are shown in Table 1 below. Drilling continues with four rigs. 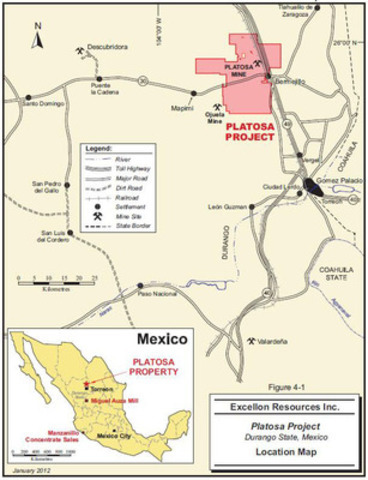 "The combination of skarn, gold, bismuth, felsic dykes and the highly siliceous granite porphyry is a strong indication that we are approaching the large-tonnage CRD-Source that is the primary goal of the Company's exploration program at Platosa," stated John Sullivan, Vice-President of Exploration. "We are also excited about the long-contemplated possibility of finding more near-surface manto-style mineralization related to the structures that channeled fluids from a deep source into the upper limestones. 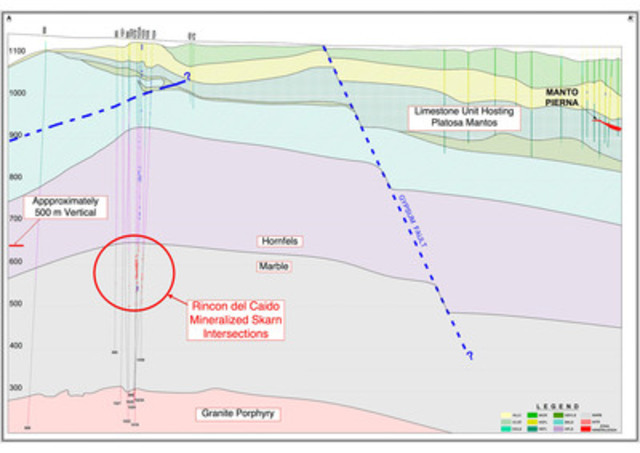 The corridor between Rincón and the Platosa Mine has seen very little drilling and virtually none of it has reached the marble unit that hosts the Rincón skarn-sulphide intersections. The potential of this area for both additional manto and Source mineralization remains untapped." * All three holes were drilled vertical and intervals are core widths. Mineralization banding lies at highly variable angles to core axes in all three holes (as is typical of skarn-related sulphide mineralization) and data points remain sparse. Further geometric information is required to estimate true thicknesses. The new mineralization is developed in a marbleized limestone sequence located beneath the thick hornfelsed shale unit that underlies the dolomitized limestones hosting the Platosa Mantos (Map 3). Relatively pristine marble extends for tens of metres below the skarn and all holes bottom in high-silica, crowded granite porphyry containing small amounts of pyrite located at approximately 800 m vertical depth. Several of the sulphide intercepts surround pervasively sericitized felsic dykes. The orientation of the mineralized skarn cannot yet be determined, but the pattern of intersections suggests strong structural control. This control may be reflected by the numerous high-angle structures that cut the overlying rock units in all holes. These structures are being carefully sampled to determine if one of them was the pathway along which mineralizing fluids escaped from beneath the hornfels into the upper, manto-hosting limestone units. The mineralization demonstrates multi-stage, pyrite-rich, massive to semi-massive textures that clearly overprint earlier pyroxene and garnet-rich skarn. Mineralization is concentrated at or near marble-hornfels contacts. The multi-stage characteristics are similar to those shown by the sulphides being mined from the Platosa mantos, although there are distinct compositional differences reflected by much higher pyrite content, the appearance of chalcopyrite and much darker-coloured sphalerite. The consistently anomalous gold, bismuth (8,280 ppm over 1.0 m in LP1023A and 1,685 ppm over 2.6 m in LP1024) and copper (0.23% over 1.1 m in LP1024 and 0.12% over 8.1 m in LP1025) combined with the overall skarn mineralogy indicate that this area is still somewhat distal to the Source itself, but may lie along a feeder system leading from the Source. The Source may lie between Rincón and the high-grade Platosa mantos currently in production, or farther to the northwest. Given the high pyrite content of the skarn, the mineralization may respond to electrical geophysical methods, and downhole geophysical surveying is underway to gather orientation data to guide further drilling. In the interim all four exploration drills are concentrated at Rincón. 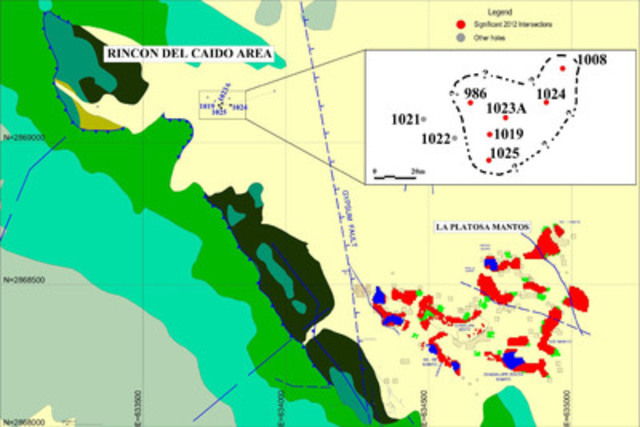 Since the exploration press release dated July 9, 2012, five holes in addition to LP1023A, LP1024 and LP1025 have been drilled at Rincón. Holes LP1020, LP1023 and LP1027 were abandoned prior to target depth because of technical problems. Holes LP1021 and LP1022, both drilled west of LP1019, encountered only minor sulphides, but do not close off the area. Dr. Peter Megaw, PhD, CPG, and Mr. John Sullivan, BSc., PGeo., have acted as the Qualified Persons, as defined in National Instrument 43-101 ("NI 43-101"), for this disclosure. All remaining illegal protesters at La Platosa have been removed and/or dispersed by the Sindicato Nacional Minero Metalúrgico Napoleón Gómez Sada, which was elected by the workers of La Platosa in a government sanctioned union election in early July, with the support of the Concerned Women of Bermejillo, a group of women from the local communities of Bermejillo and Mapimi whose livelihoods were threatened by the ongoing disruptions at the mine. Excellon is currently in full production at La Platosa and has resumed shipments to the Company's mill at Miguel Auza, Zacatecas. An updated production forecast for the remainder of 2012 will be released in due course.